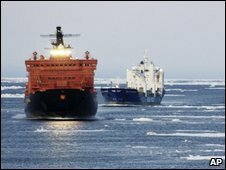 Two German merchant ships are sailing from Asia to Europe via Russia's Arctic coast, having negotiated the once impassable North East Passage. This route is usually frozen but rising temperatures in the region caused by global warming have melted much of the ice allowing large ships to go through. The North East passage has tempted mariners for hundreds of years. In 1553 the British voyager Sir Hugh Willoughby died attempting to find the route. The German ships Beluga Fraternity and Beluga Foresight arrived in the Siberian port of Yamburg, in the Ob river delta, on Monday, owner Beluga Shipping GmbH said on its website. Both ships left South Korea in late July, negotiating the passage off north-eastern Siberia behind two Russian icebreakers. "We are all very proud and delighted to be the first Western shipping company which has successfully transited the legendary North East Passage and delivered the sensitive cargo safely through this extraordinarily demanding sea area", said Beluga CEO Niels Stolberg. The ships have been offloading some of their cargo. Beluga spokeswoman Verena Beckhusen told AP that the Beluga Fraternity had already left to continue its journey via Murmansk to the Dutch port of Rotterdam. The Foresight's departure has been postponed until Saturday because of bad weather, she added. But the once impenetrable ice that prevented ships travelling along the northern Russian coast has been retreating rapidly because of global warming in recent decades. The passage became passable without ice breakers in 2005. By avoiding the Suez canal, the trip from Asia to Europe is shortened by almost 5,000km (3,100 miles). The company behind the enterprise says it is saving about $300,000 per vessel by using the northern route. Both the Russian authorities and the German shippers are keen to prove the safety and efficiency of the passage, believing it could be a valuable commercial alternative to the Suez canal in summer. Despite the rise in temperatures the route is still dangerous, with icebergs moving more freely in the warmer waters. Scientists estimate that the last time that the North East Passage was as ice free as it is now was between 5,000 and 7,000 years ago.